This Gulf Shores Vacation Rental is a water front paradise located on the south side of the Little Lagoon in Gulf Shores Alabama. This non-smoking cottage with accommodations for 8 has two bedrooms, two bath rooms, living room, dining area and kitchen. Other amenities include 3 TV’s, VCR/DVD player, two queen beds, two twin beds, sleeper sofa, queen (Sleeper), wireless internet, phone, dish washer, microwave and laundry room with washer and dryer. The living room, dining room and Kitchen overlook the private balcony and boat dock with a beautiful view of the Lagoon. The afternoon sunsets are sensational and provide excellent photo opportunities for pictures that can be taken from the balcony. 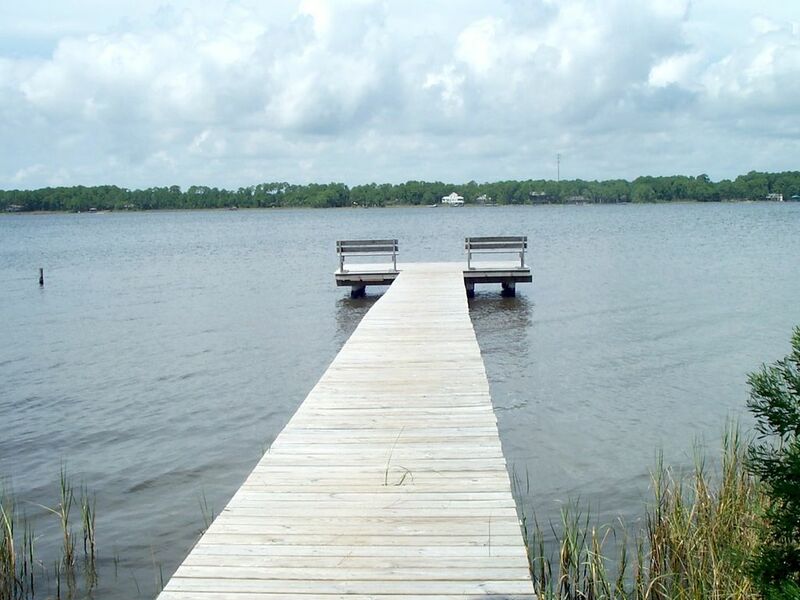 You can enjoy fishing, swimming and boating in the Lagoon or you can walk or drive short distance to the beautiful white sands and rolling waves of Gulf Shores Beach. Little Lagoon is 10 miles long and ½ mile wide. It is separated from the Gulf by a ½ mile wide stretch of beach known as West Beach. You can launch your boat at Lagoon Park on the other side of the water. There are two walking trails that are part of the 7,000 acre Bon Secour National Wildlife Refuge for migratory birds and nesting sea turtles located on the north side of the Lagoon. You can walk along the gravel and wooden walkways and see lagoon beaches, inland marshes, live oaks and wildflowers. There are also plenty of bike riding trails around the area where you can get close to nature and enjoy the wildlife. Charter boats are available for deep sea fishing at several locations. The Cottage is centrally located to Gulf Shores City Beach, Little Lagoon Pass, City Recreation Complex, Golf Courses, Waterville, Shopping and all the best Restaurants and Entertainment spots in the area. Keep an eye out for your favorite country or rock & roll entertainers and order your tickets for a concert at the Wharf Ampitheater. Come stay and play at our place in Andrews Cottage and have a good time any time of the year.